New Hampshire's gubernatorial candidates faced off for the first time on Wednesday night in a debate at New England College in Henniker on necn. It was an exciting and passionate debate between Republican Chris Sununu and Democrat Colin Van Ostern that touched on a lot of hot topics, including Medicaid, gun control and the state's opioid crisis. One of the most heated exchanges came when Councilor Van Ostern explained his plan to make Medicaid expansion, a critical issue for many Granite Staters, permanent. "I want to know how are you going to pay for it? For a guy who says he's not going to raise any taxes and fees, where are you going to come up with the hundreds of millions of dollars of a government, Washington program that we have no control of to pay for it?" Sununu asked. "Well this is an issue the Legislature has tackled and tackled successfully. Right now, we had to figure out how to fill the gap for the next couple of years and we did that because when hospitals see 27 percent fewer people showing up uninsured in their ERs, that means that last year they spent $140 million less than on uncompensated care," Van Ostern countered. There was also a tense moment later in the debate when the candidates defended their parties' presidential nominees. "There is not a shadow of a doubt of who I feel more comfortable with their hand on the nuclear trigger. Donald Trump would be ... a dangerous disaster for our country," Van Ostern said. One of the night's hot topics in Wednesday's New Hampshire gubernatorial debate included the ability of those who have been diagnosed with mental health issues to obtain firearms. He added that politicians who have endorsed Trump, including Sununu, should have their judgment called into question. "Are you saying Bill and Hillary Clinton are good role models for kids?" Sununu asked. "I actually think Hillary Clinton ... who was a great Secretary of State and [sic] Senator, I'm proud that my two young boys will look up to her and see that she is going to be President of the United States," Van Ostern replied. Sununu said that Clinton has lost the public's trust, which is why he has endorsed Trump. 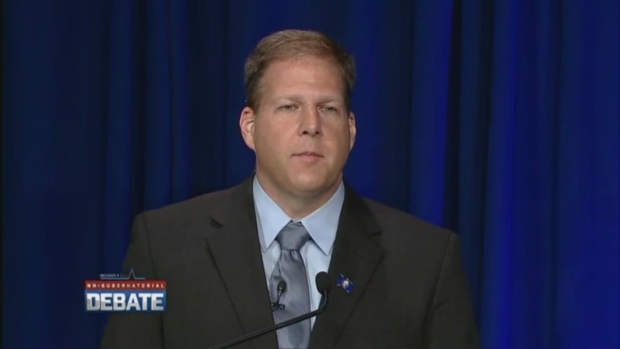 "Tonight, voters saw in Chris Sununu a candidate for Governor focused on restoring strong, bold leadership to New Hampshire's corner office," said Sununu Campaign Manager, Paul Collins. "His commitment to keeping taxes low, reducing burdensome regulations and finding a sensible New Hampshire-based solution to record-high healthcare costs will get our state moving again. 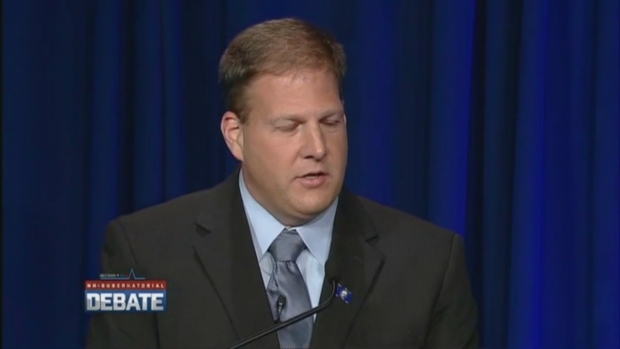 The people of New Hampshire deserve a Governor who will fight for them and Chris Sununu will be that Governor." "While Colin Van Ostern has the record needed to bring Democrats and Republicans together to move New Hampshire forward, Chris Sununu puts politics ahead of what's best for New Hampshire and that was on full display tonight," said Pat Devney, campaign manager for Colin Van Ostern. "Whether it's cutting off funding for women's healthcare because it's politically convenient, opposing the bipartisan New Hampshire Health Protection Plan that's expanded access to healthcare to over 50,000 Granite Staters, or repeatedly standing in the way of renewable energy projects that have broad local and bipartisan support, Chris Sununu's political games have held New Hampshire back and Granite Staters can't afford his failed leadership." Wednesday's debate was the second of two New Hampshire debates being sponsored by necn, which was co-sponsored by the Concord Monitor, WGIR-AM 610, WKXL-AM 1450 and New England College. The U.S. Senate debate between Republican Kelly Ayotte and Democrat Maggie Hassan was held on Monday night.